Verona is a beautiful city and a host to a number of world-class sightseeing destinations. From Arena di Verona to Juliet’s House, they all vie for your time and attention. 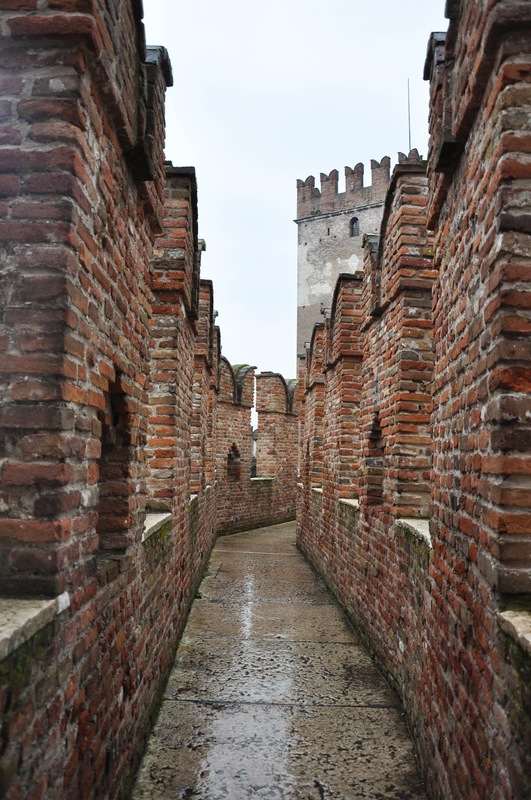 Don’t skip on Castelvecchio – Verona’s old castle and the bridge that is attached to it! As any heartfelt recommendation, this is based on a mistake that I made not once, but twice. The first time that I visited Verona (in September 2007), I only made it to the courtyard of the castle, missing out on the fabulous museum nestled inside it. The second time (in November 2014), I skipped out completely this pearl in Verona’s crown. Thankfully, only last week I was back to the city of Romeo and Juliet for a portion of Carnevale on Friday and then to spend a romantic St. Valentine’s on Saturday with my husband. 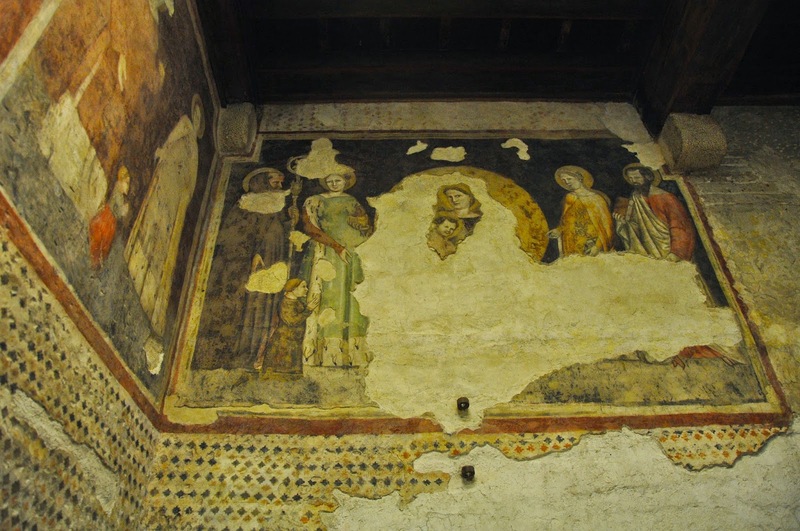 I am pleased to report that between these two events we managed to squeeze in a visit to Castelvecchio. It was absolutely brilliant! So, don’t make my mistake. Make sure that you go there the first time that you are in Verona. 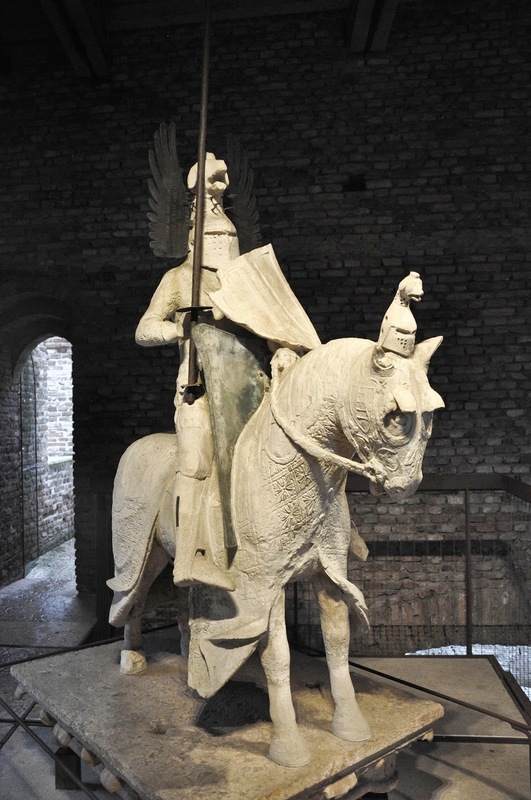 Built by the powerful Scaliger dynasty, who ruled the city in the Middle Ages, Castelvecchio is a short walk away from Arena di Verona and on the banks of the river Adige. 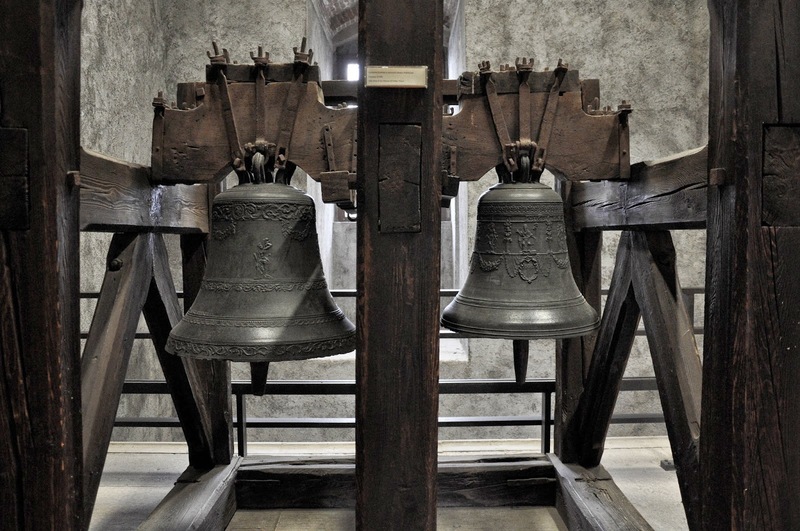 Once a military fortification, nowadays it houses a collection of art, armoury, ceramics, some jewellery and old bells. 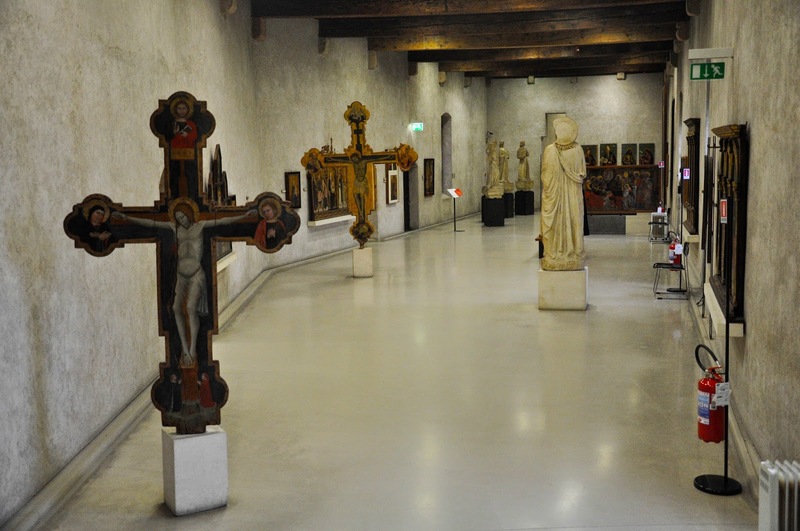 The museum has 29 rooms. We only had about an hour, so I coolly thought: ‘Two minutes per room and we will be done with some time to spare’. The collection is exquisite though and we couldn’t help it but spend much longer admiring the art in the first rooms and then, unfortunately, had to rush through the final ones. I just know that we will be back there soon and try to dedicate at least a couple of hours to this fabulous place. 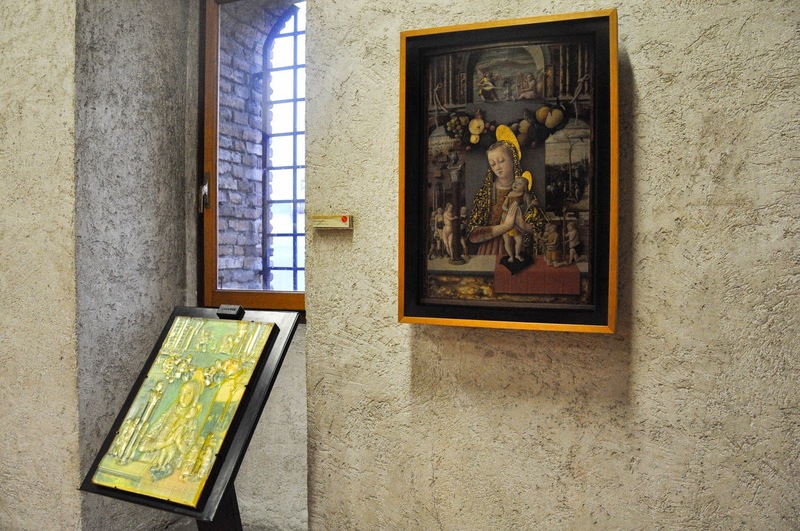 Now, let me take you on a walk through Museo Civico di Castelvecchio and show you the pieces that made an impression on me. 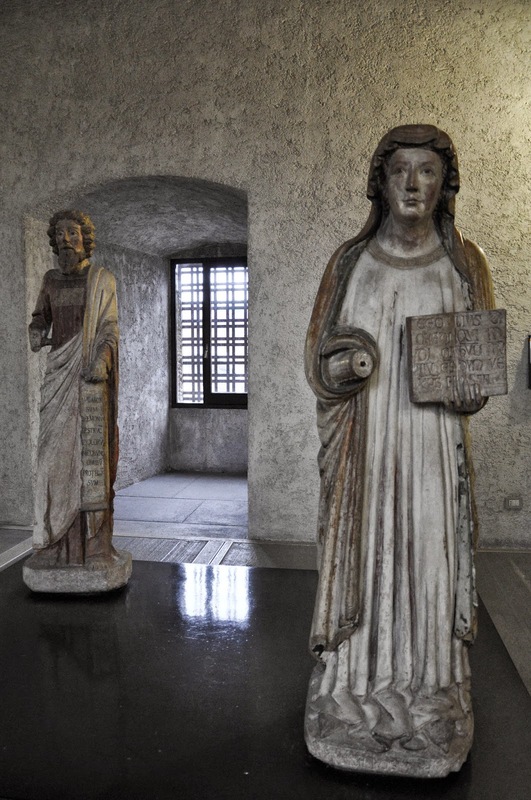 The first chain of rooms on the ground floor of the museum houses a collection of medieval sculptures, bas-relieves and sarcophagi. 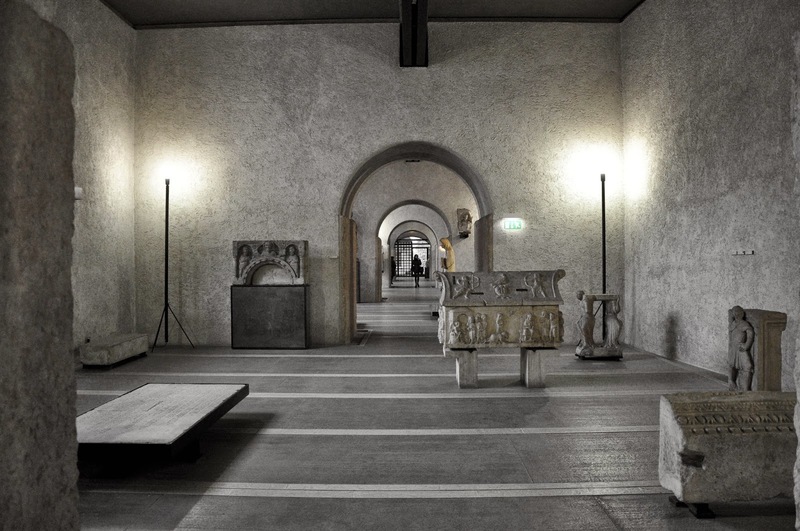 The tones and the light are muted and as you walk through the rooms you feel like silence is best advised. The sculptural faces impress with their simplistic features. It’s like the masters of so many centuries ago were rather interested in expressing a strong emotion rather than achieving a perfect physical representation. 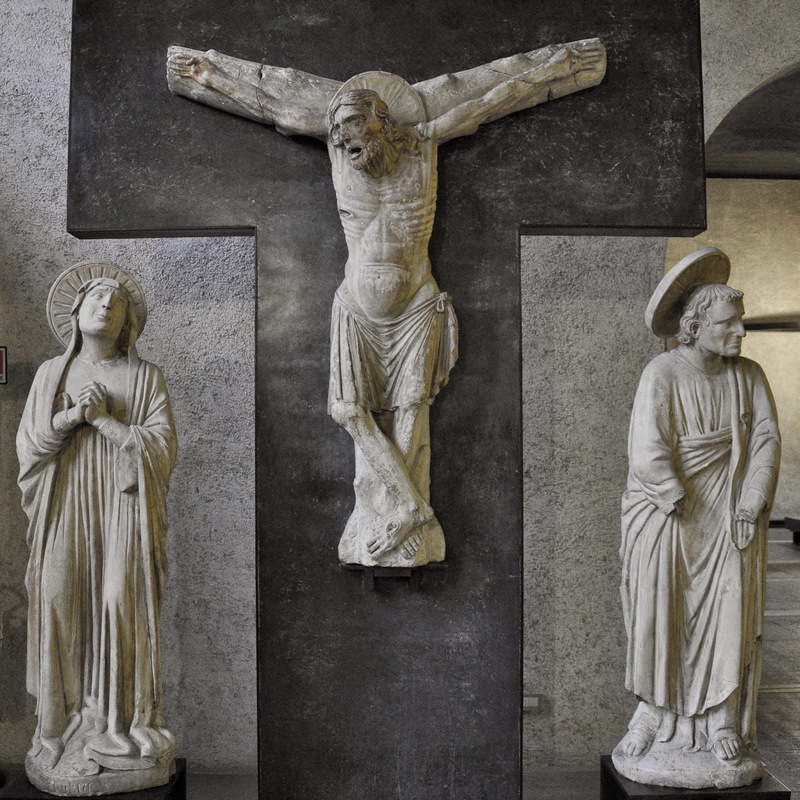 I was particularly taken with this 14th century Crucifixion and the look of mental anguish and emotional pain on Jesus’s face. The other thing that intrigued me about it was the T-shape of the cross. 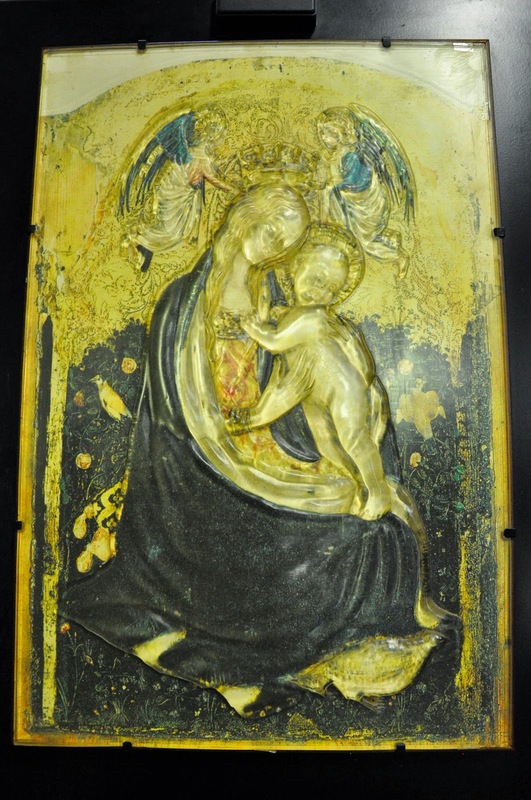 From there we progressed to the first floor of the museum, where we were greeted by a welcome burst of colour, emphasised by the gold leaf generously applied to the priceless works of art. 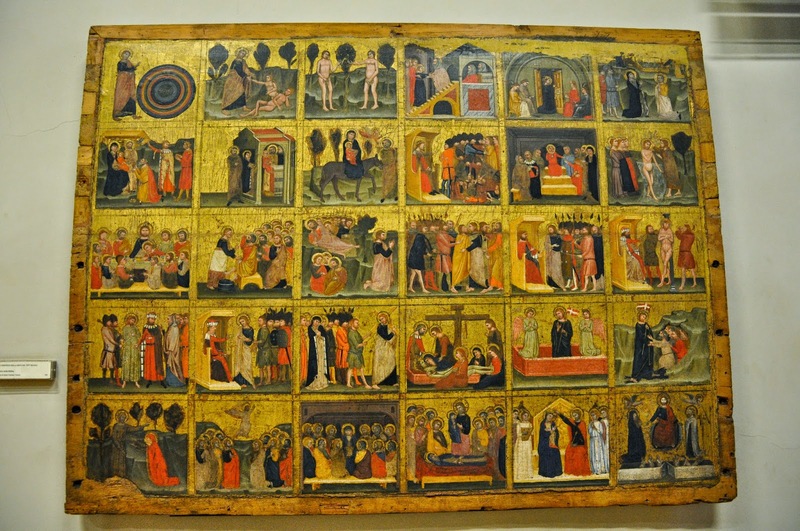 This panel is from the middle of the 14th century and it represents in minute detail 30 biblical stories painted on wood. I was particularly taken with the painting below. 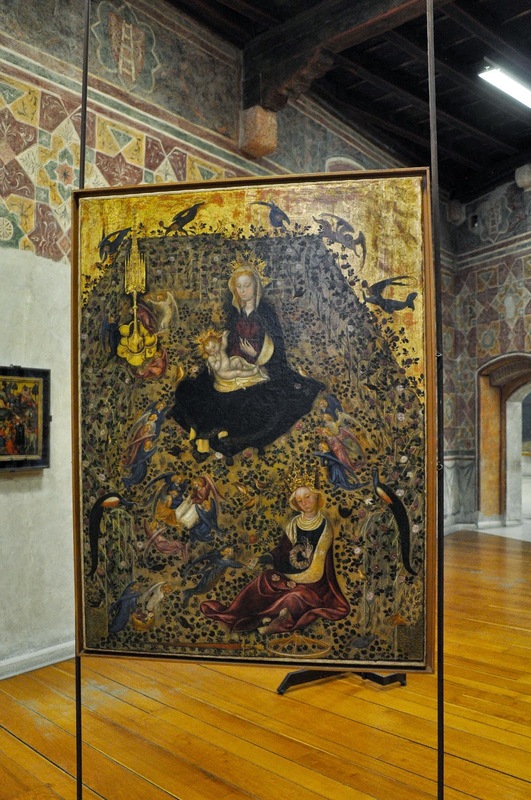 It also helped me to keep my toddler entertained, as she had started to get a bit bored with all that art. I pointed the different birds to her and asked her what they do. Eager to show a newly acquired skill, my little daughter started twittering. The other visitors of the museum cracked a smile and I got some extra seconds to admire the painting, before rushing off to the next room. 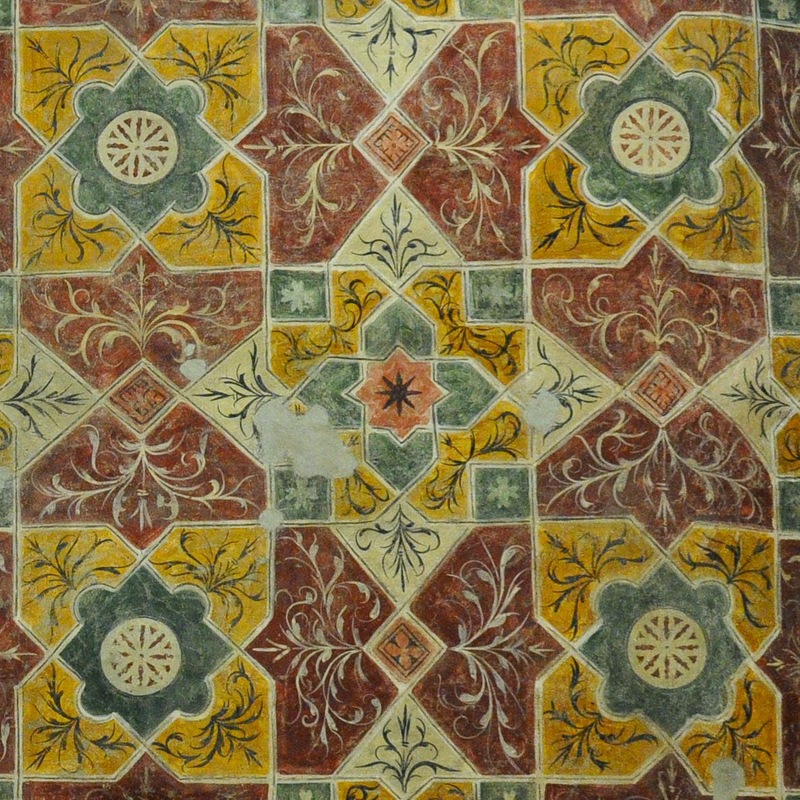 Another thing that made an impression on me were the preserved painted walls. 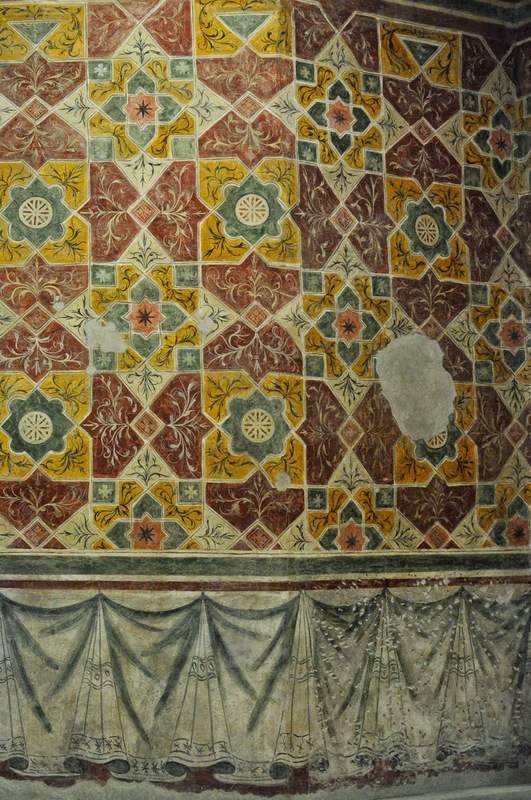 In spite of the many scratches and whole missing patches, it gave me an idea how sumptuous the rooms must have been in the castle’s heyday. We continued exploring the museum. 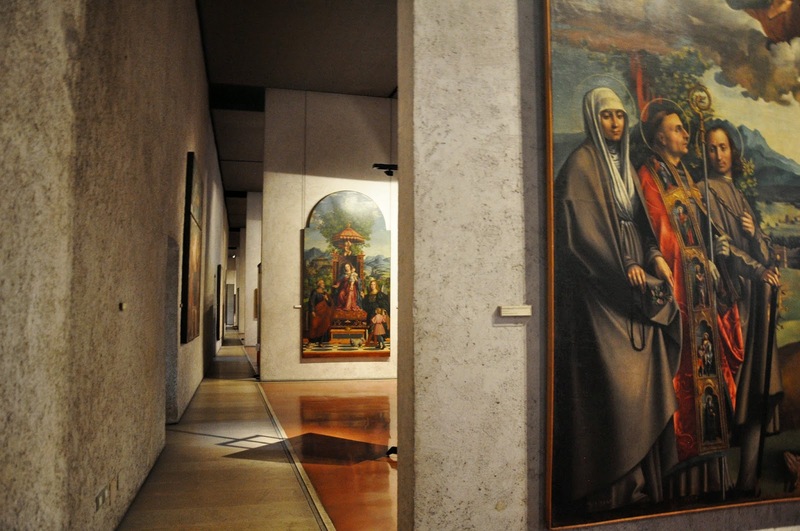 The rooms filled with religious art followed one after another in quick succession. There were also quite a few steps to negotiate. It was good that we had left the buggy with the helpful girls at the ticket office. Paintings and sculptures would grab our attention and attract us to themselves. Unfortunately, their captions were rather succinct, citing only the century, the title of the work of art and its author. Yet each piece would provoke deep curiosity in me. I wanted to know things like: ‘Why is the shape of the painting below so quirky?’, ‘What is its story?’, ‘How it came to the museum?’. 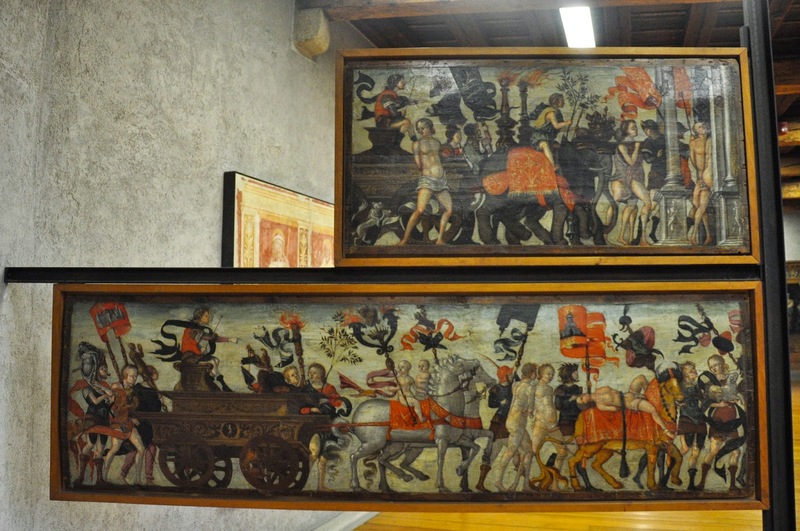 It would have been great if there had been more information provided, just like in the Civic Art Gallery of Palazzo Chiericati in Vicenza. Something else caught my eye though. In some of the rooms I had spotted deeply embossed works of art placed on a tripod. They seemed to have been made of glass (initially I thought it was rock crystal) and had no captions explaining what they were. Still, I admired them for a while, as they were like nothing I had seen before. Only after a while, I realised what these were. Some of the works of art in the museum had been translated in embossed glass for the visually impaired visitors to be able to feel them. You can see below the original painting and its glass representation next to it. After so many rooms with exquisite art, we had reached the top floor of the museum. 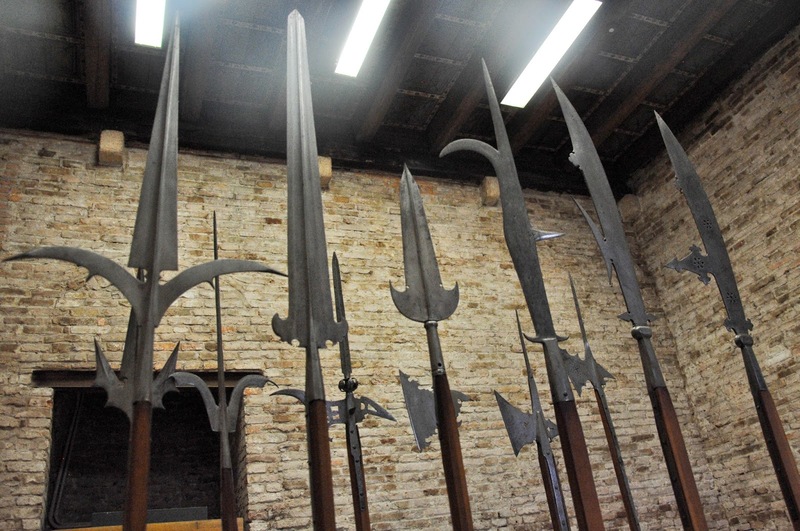 A simple glass door led us into the armoury with its collection of helmets, breast-plates and (what impressed me the most) some inventively cruel lances. From there a steep staircase led us to the walkway between the battlements of the castle. It felt good being outside and breathing in the moist air. 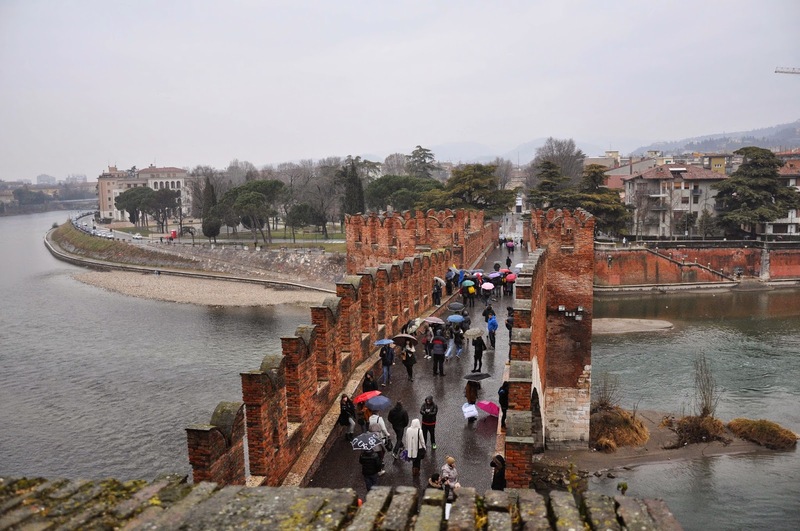 The rain which had been battering Verona all afternoon had stopped for a little bit just at the right moment to allow us to admire the views towards the river Adige on one side and the courtyard of the castle on the other. The walkway led us to an alcove where we were greeted by a knight in full armour. Time was flying past though, so we retraced our steps among the castle’s battlements, opened another glass door and continued our rushed exploration of the museum. We found ourselves in the final chain of rooms dedicated to the art of the 16th to the 18th centuries. 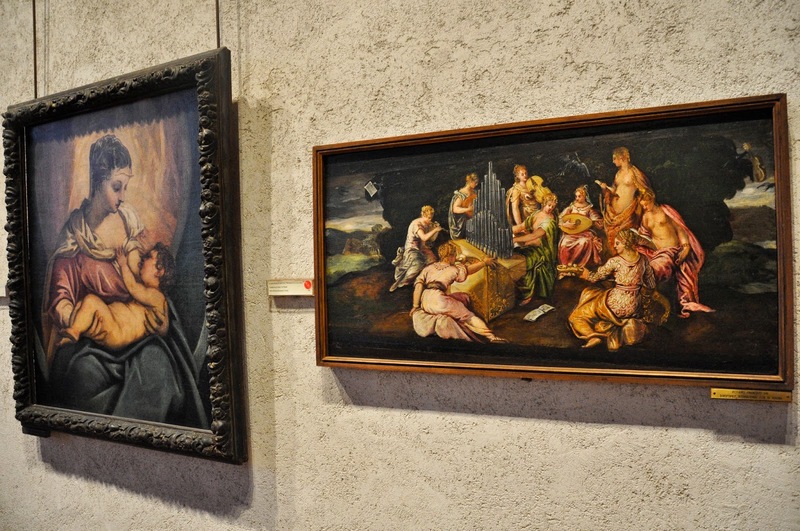 Fabulous paintings by Tintoretto, Veronese and a whole host of Italian artists adorned the walls. This painting by Giovani Francesco Caroto was our favourite. 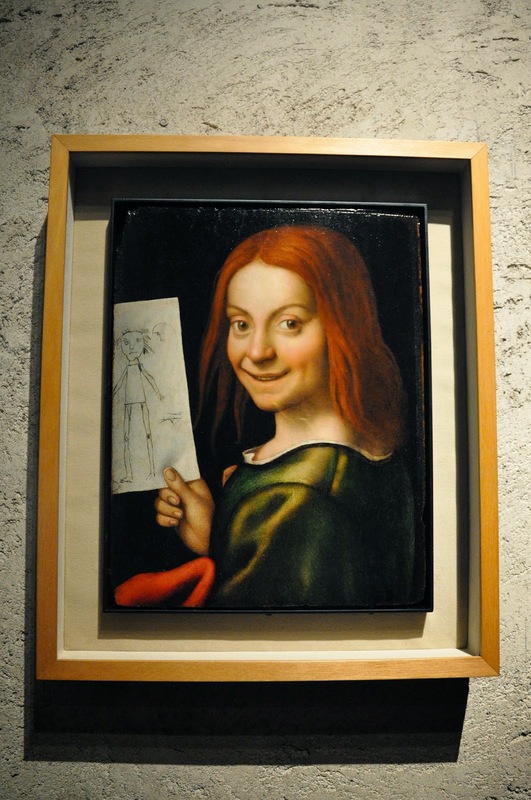 The portrayed boy had a particularly arresting face. As soon as I managed to take my eyes off it, my husband pointed to me the drawing the boy was holding. In its abstractness it appeared really modern, especially considering that the painter lived five centuries ago. Our hour was up and, rushed off our feet, we were off to our next appointment in fair Verona. Needless to say, I am looking forward to our next visit to this enchanting museum.